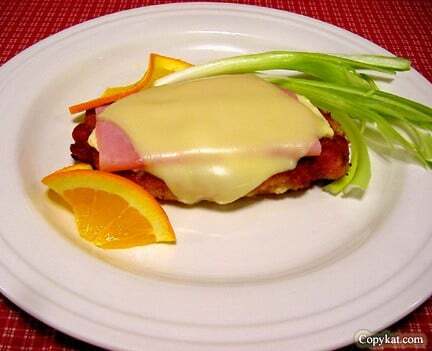 Breaded chicken breasts with ham and swiss cheese make a great alternative to Chicken Cordon Bleu. Cafeteria food is such a comfort to so many of us; we have all eaten at cafeterias. What’s better than getting to pick and choose exactly what you are going to enjoy? These chicken breasts are somewhat like Chicken Cordon Bleu, but they are easier to make and sure to please all of your guests. You can make Luby's Chicken Durango with this copycat recipe. Pound chicken breasts until they are 1/2" thick. Mix seasoned salt and pepper with bread crumbs; set aside. Dust chicken with breadcrumbs, dip in milk, then dip chicken back in breadcrumbs. Place chicken in a heated fry pan with just enough vegetable oil to cover the bottom of a pan. Fry breasts on medium heat until golden brown. Remove chicken breasts and place on serving tray. Spread breasts with tartar sauce. Place ham on chicken. Top ham with a slice of the Swiss cheese. Place chicken Durango in oven or microwave just long enough to heat and melt cheese. Serve with your favorite salad or side vegetable. To help even the cooking time, I highly recommend pounding out the chicken breasts and making them thinner. If you are trying to save calories, this helps you feel like you have received a larger piece of meat than you actually have. Stepanie, I want to thank you for all of your effort and talent on this website. I’ve never got on my pc without first checking for new recipes. You my friend contribute so much and it shows in eveything I see on copykat.com. A big pat on the back for you girlfriend…..you wok!!! Thanks so much! I appreciate the lovely compliments. Comments like these makes what I do worthwhile!